Can Ants, and the Plants That Rely On Them, Take the Heat? Ants are one of nature's most efficient and ecologically important creatures. Over one third of all herbaceous plants in eastern deciduous forests rely on ants for seed dispersal. Similarly, ants are responsible for modifying their ecosystem through soil turnover, litter processing and decomposition. One reason for the importance and success of ants is the fact that they are eusocial, which means that they live together in colonies wherein certain individuals lay eggs while others tend to the eggs and search for food. Eusociality greatly increases the efficiency with which ants can defend themselves and forage for resources. At the same time, however, it may also make ants more sensitive to global climate change. Dr. Sharon Bewick studies how ant communities might be affected by disturbances in the global climate as a part of her research as a postdoctoral fellow at the National Institute for Mathematical and Biological Synthesis. She also wants to know how temperature changes might affect the delicately balanced ecosystems in which ants live. 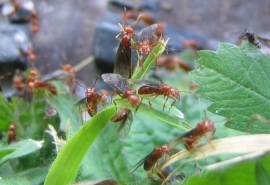 "Many plants rely on ants for seed dispersal, and so disruptions to the ant community, such as global climate change, can have consequences for the plant community as well," Bewick explains. What happens, for instance, if one ant starts foraging earlier in the season because of warmer temperatures? Does that then alter the abundance of other ants? Does that change the composition of the plant community?” Bewick asks. Bewick uses mathematical modeling to answer these and other questions about how climatic change affects biological communities. "Mechanistic questions like these are crucial to understanding the full extent of the impact of global climate change," Bewick says. "However, they are difficult to answer without a mathematical modeling approach." Having earned a Ph.D. in Chemistry from Princeton University in 2006, Bewick's previous research experiences have ranged from quantum chemistry to chemical kinetics and viral/immune dynamics. Bewick, who hails from Ontario, Canada, most recently completed a one-year postdoctoral fellowship in the Department of Material, Aerospace and Biomedical Engineering at the University of Tennessee, Knoxville (UTK). Now, as she moves into a more ecological field of work, she admits to a fascination with ants that began in middle school when she came across a book about them in the library. "Sometimes it seems like they have this entire little world going on that I know nothing about," Bewick says. "I'd like to learn more about that world." Bewick's mathematical modeling research on ants will be conducted while field experiments on ants are underway at UTK. In the field experiments, ants are placed in special open-top chambers in which the temperature is changed to simulate warming. Ant and plant interactions are then monitored. Bewick uses the data from the experiments to help formulate her computer models and validate results. Ultimately, Bewick hopes that her research will help guide experimental scientists in their work to understand what species are particularly affected and susceptible to climate change. For more information about postdoctoral fellowships and other research and educational opportunities at NIMBioS, visit our website at http://www.nimbios.org.